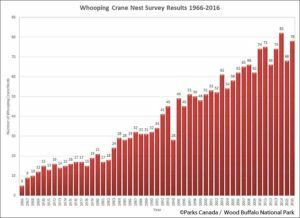 A total of 78 nests were located during the 2016 Whooping Crane nest survey in Wood Buffalo National Park (WBNP) and in crane habitat located outside the Park. The survey is a joint project between Parks Canada and the Canadian Wildlife Service. The 78 nests detected is the second highest nest count on record. 71 nests where located within WBNP and 7 nests were located outside of the Park. The highest nest count on record is 82 nests located during the 2014 nest survey. Nest numbers increased over last year’s count, when 68 nests were detected during the 2015 survey (the low number of nests detected during the 2015 nest survey is believed to have been related to the low water levels/drought in the nesting area). Nest survey results for the period 1966 to 2016 are shown in the graph below. Conditions on the nesting grounds were much wetter in 2016 when compared with the conditions observed during the 2015 survey. Water levels on the Sass River and Klewi River were noticeably high. Over-the-bank flooding was observed along the Sass and Klewi Rivers and replenishing waters into the neighboring ponds and wetlands. The survey was conducted over four days, May 19, 20, 22 and 23. Poor weather conditions on May 22 prevented flying. The aircraft used during survey was an ASTAR 350 B-2 Helicopter. – Howard Vigneault, Helicopter Pilot, Highland Helicopters6. Interesting observations during the survey included a total 193 cranes observed over the 4 days. Occasionally the cranes standup and/or walk off the nest mound as we circle above and we get to count the eggs. A total 37 Whooping Crane eggs were observed at 19 of the 78 nests during the survey. 18 nests had two eggs, 1 nest had one egg. (We were unable to determine the number of eggs at the other 59 Nests). We observed one pair of Whooping Cranes that were “dancing”. One group of 3 whooping cranes was observed. A lone adult Whooping Crane was observed being harassed by 2 “dive-bombing” red-winged black birds. Two black bears were observed in the nesting grounds. 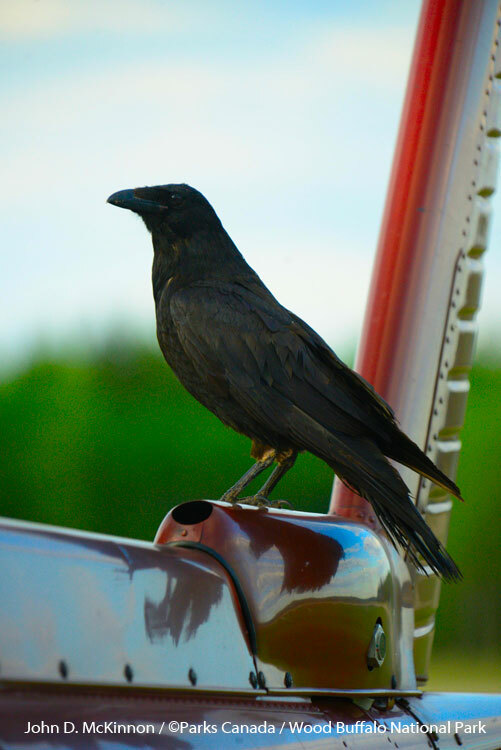 And, on the last day of the survey, a raven greeted us just before take-off, posing for a picture while perched on the tail of the Helicopter. Where are the wild Whooping Cranes and what are they doing? Where are the Wild Whooping Cranes? Wild Whooping Cranes are now on Wood Buffalo National Park, Canada. They arrived there during late April and May after migrating 2,500 miles from Aransas Refuge on the Texas coast. Each nesting pair located their nesting site which is normally in the same general area as past years. Park records show that several pairs have nested in the same areas for 22 consecutive years. Soon after their arrival on their nesting grounds, they build their nest. 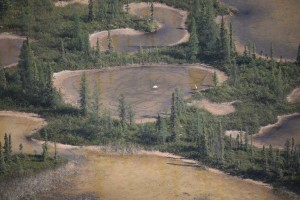 Nesting surveys completed to-date indicates that 78 Whooping Crane nests have been observed. Their nesting territories vary in size but average about 1,500 acres. 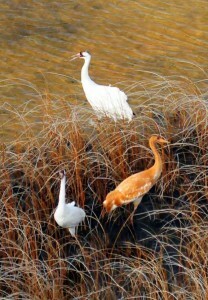 Whooping Cranes guard their territories and nesting neighbors normally locate their nest at least one-half mile away. Nests are normally constructed in shallow water. Vegetation from the local area is used to construct nest. Eggs are usually laid in late April to mid-May. Normally two eggs are laid but occasionally only one and rarely three have been observed in nests. Incubation begins when the first egg is laid. Incubation occurs for about 30 days. Because incubation starts when the first egg is laid, the first chick hatched is about two days older than the second hatched. This difference in age is substantial and creates problem for the younger chick. It is weaker than the older chick and has difficulty keeping up as the adults move around searching for food. The younger chick often dies due to its weakness. Records indicate that only about 10% to 15% of the second chicks hatched survive. Importantly, the second egg plays an important role in providing insurance that at least one chick survives. 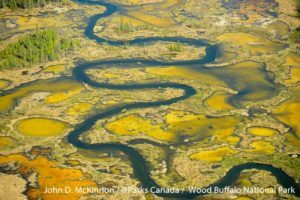 For many years the location and whereabouts of the whooping crane nesting grounds of the only wild flock of whooping cranes remained elusive and unknown. Whooping crane observers only knew that the birds migrated from “somewhere” in Canada to the Texas Coast. As pressure mounted to protect and manage the birds, it was important to locate their nesting grounds so these essential habitats could be protected before it was too late to save the whooping crane from extinction. 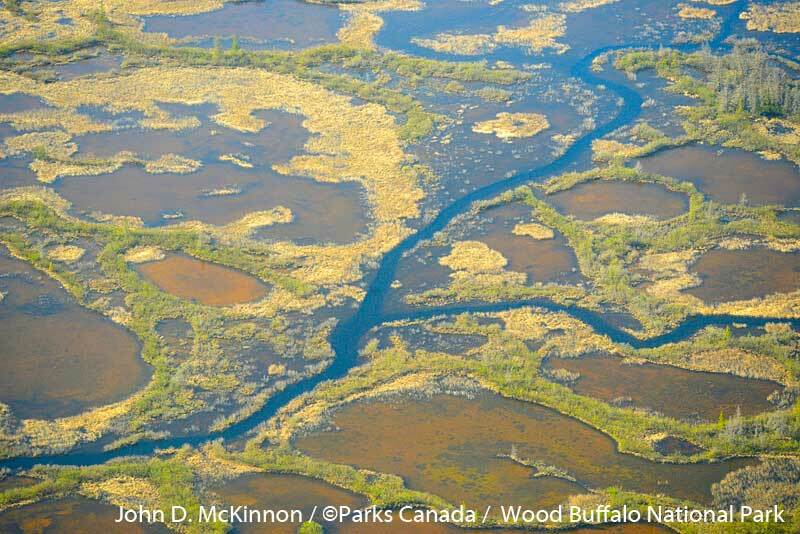 In 1954 the whooping crane nesting grounds in Wood Buffalo National Park were discovered. 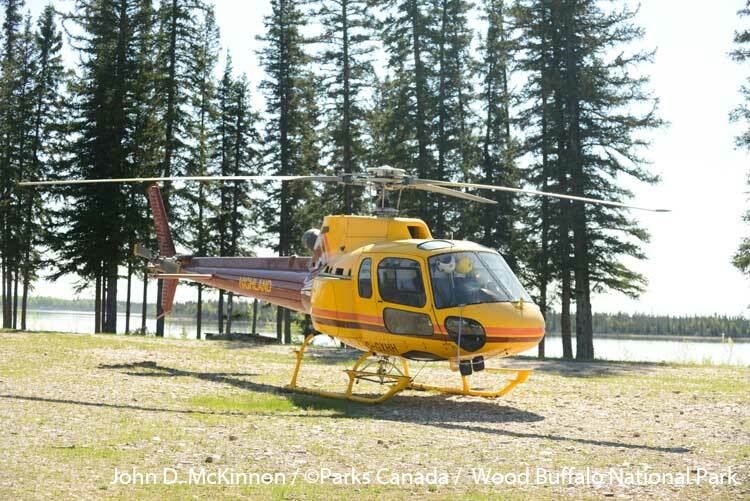 This past spring and early summer saw warm temperatures and little rain at Wood Buffalo National Park, resulting in wildfires within the park’s boundaries. In 1954 when the nesting grounds were discovered, conditions were similar and if it hadn’t been for one of these fires and one observant forester, the nesting grounds may not have been discovered in time to save our beloved and majestic whooping cranes. Dr. William A. Fuller is often given credit for the discovery of the whooping crane nesting grounds but FOTWW invites you to read his account, in his own words, of this historic discovery and whom he believes should be given credit for it. I have received a lot of credit for the discovery in 1954 of the only whooping cranes in Canada, but if it hadn’t been for the fire and an observant forester named George Wilson, I might never have gone out to identify the birds. 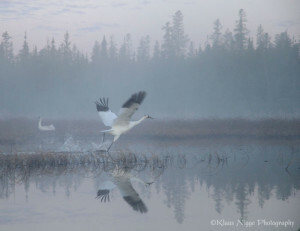 The last nest of a whooping crane had been seen in about 1926 in Saskatchewan. Members of the U.S. Fish and Wildlife Service (USWS) and others had searched from central Saskatchewan to the delta of the Mackenzie River without success. The USWS was interested because whoopers migrated to Texas. In 1945, I spent the summer working on fish in Lake Athabasca. At the end of the summer I decided that I would never return to the north. However, in 1946 I signed up to spend the summer at Great Slave Lake. The following winter I put together all the data that had been gathered over several years on the “Inconnu” (Stenodus leucichthys) and submitted the result as my masters thesis for the University of Saskatchewan. Convocation took place in early May. A few days after the ceremony, I turned 23, and on the last day of May I married the young lady who is still my wife. I had previously applied for one of two jobs advertised by the federal government, and I was approved for the one based in Fort Smith, NWT. I found the north gets under your skin, and my wife Marie and I landed in Fort Smith on June 5. My duties centerd on mammals in the south half of the Mackenzie District and in Wood Buffalo National Park (WBNP), part of which is in Alberta. In those days, the United States sent a bird guy, Bob Smith, and an assistant down to the Arctic Ocean. They flew out of Fort Smith for two or three days, and I usually took them up on their invitations to go on their sorties. Bob was a great guy, as well as a good pilot and a good bird man. Although waterfowl were the main target, they kept their eyes open for other birds, such as whooping cranes. As late as 1954 they had not made a sure discovery of whoopers, although on an earlier flight with them, one thought he had spotted a crane, but by the time Bob swung the plane around, whatever had been seen had disappeared. In June 1954, a fire broke out in the northern part of Wood Buffalo Park. On June 30, the fire crew radioed to Fort Smith that one of their pumps was out of order. The forestry guy, George Wilson, went out to the site of the fire in a whirlybird piloted by Don Landells. I was in my office around 4:00 p.m. when a message came in from the plane to the effect that George and Don had seen a few big white birds, which they suspected were whooping cranes. Furthermore, Landells was to make another trip on the same route with a new pump, and if Bill Fuller was at the landing spot at 5:00 p.m., he could go back with Don and the pump. Bill Fuller was at the landing and ready to go at 5:00 p.m. Don took us back on about the same route he had flown earlier, and we did see some large white birds, which were certainly whoopers. There were young birds as well as adults, so there was reason to believe that the nesting grounds were not too far away. I think we saw about nine birds on that first trip. I sent a telegram to the head office in Ottawa later that evening. Ottawa’s reply the next morning asked me to keep an eye on the birds whenever there was a chance. I made several trips on an ordinary prop plane. On one such trip I counted thirteen birds, which was just over half of the birds (21, I think) counted in the Texas flock at that time. Two adults and one juvenile whooping crane.Photo: John McKinnon / ©Parks Canada /Wood Buffalo National Park. The Whooping Crane Society and the USWS were very excited about the discovery, and soon there was talk about a ground survey in 1955. Canadian and American scientists would carry it out. However, the Canadian Wildlife Service (CWS) did not want to commit to that until there was proof of nesting, so I was to take a look next spring as early and as often as possible. In those days, light aircraft landed on skis in winter and on pontoons in summer. The changeover was made in Edmonton in spring and fall, so it was difficult to find transportation just when I needed it. While our government plane was in Edmonton, I got a ride with a pilot from Yellowknife on his way to Edmonton. I got another ride in a plane owned by the RCMP in Fort Smith. On that flight I saw what could only be a crane sitting on a nest. So the ground survey was on. Robert P. Allen of the National Audubon Society was to lead it. When Allen arrived in Fort Smith, we made one flight over the area so I could show him the location of the known nests. I made other flights, and I think I found a few more nest sites, but when the ground survey came on, I was at a conference in Alaska. The attempted ground survey is a story of its own. In 1956 I moved to Whitehorse in the Yukon, and Ernie Kuyt of the CWS took over work on the cranes. I had flown over the region of the first sightings a number of times. I had noted the tracks in the mud and searched my brains for a mammal that would make such a trail in the soft mud of the lake bottoms. Big birds never crossed my mind until I saw the cranes there in 1955. So who discovered the nesting ground? Wilson and Landells, who saw the big white birds? Me, because I saw young birds as well as mature birds on my sorties in 1955 and was also the first to see a female on a nest in the spring of 1956? It doesn’t really matter. The important point is that an important nesting ground was found. Each year for several more years, Ernie Kuyt found new nests. The total number of cranes in the Texas/WBNP flock has continued to increase in most, if not all, years since 1955. * Published in Wild Lands Advocate, The Alberta Wilderness Association, December 2004 • Vol.12, No. 6, pages 16 and 17. Friends of the Wild Whoopers (FOTWW) has received many questions concerning effects of the current drought and wild fires in Wood Buffalo National Park. Our “Friends” want to know how the drought and fires are affecting the wild Whooping Cranes. So, we contacted officials at Wood Buffalo to get the facts. The following list of questions and answers were provided to FOTWW. Answers were provided by Stuart MacMillan, the Resource Conservation Manager for Wood Buffalo National Park. Q1. What are current conditions like in the park? A1. Wood Buffalo National Park is experiencing drought conditions. Current conditions in the wetlands where the cranes nest indicate that there is sufficient water for the birds to forage for the food they need. Q2. In general, how can the drought and the shortage of water affect the population of the whooping cranes in the park? A2. 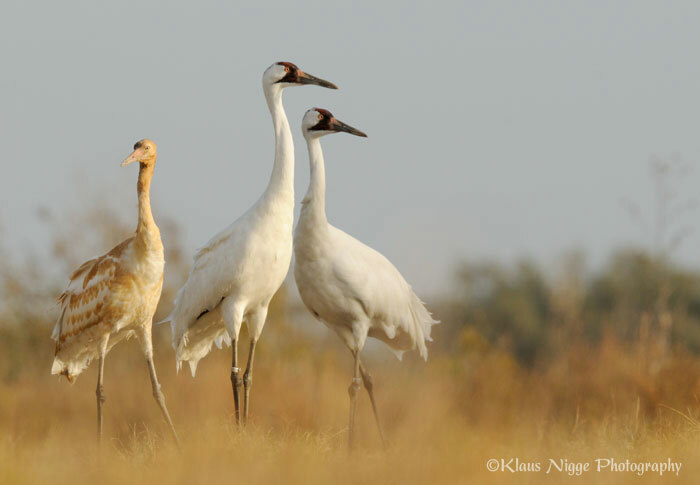 During dry years, the cranes food supplies may be diminished and both adult and juvenile cranes may have to move further from nests to forage for food. Dryer conditions may also make it easier for land predators to access their nesting sites. Q3. Is this the first time the Park has been faced with this problem? A3. Dry conditions are not uncommon in Wood Buffalo National Park. The cranes have survived here during dry years and during severe fire years. They are adapted to survive in this landscape. In the past, fires have burned large portions of the nesting area during drought years (e.g.,1981), but previous research indicates that wildfires do not appear to have influenced whooping cranes’ choice of nest sites. However, below average Whooping Crane production during drought years has been documented in the past (1990-1991). Q4. What effect does wildfire have on the cranes? A4. 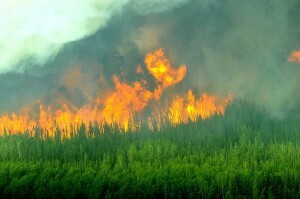 The number of wildfires also increases during drought years. Wildfires are generally thought to have beneficial effects on crane habitat by recycling nutrients and removing and thinning vegetation on the forested ridges between nesting ponds, making the area more accessible to cranes. Right now, there are no major fires in the core Whooping Crane nesting area. Q5. 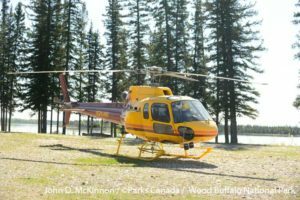 How do you manage fires when they are near the Whooping Crane nesting sites? A5. 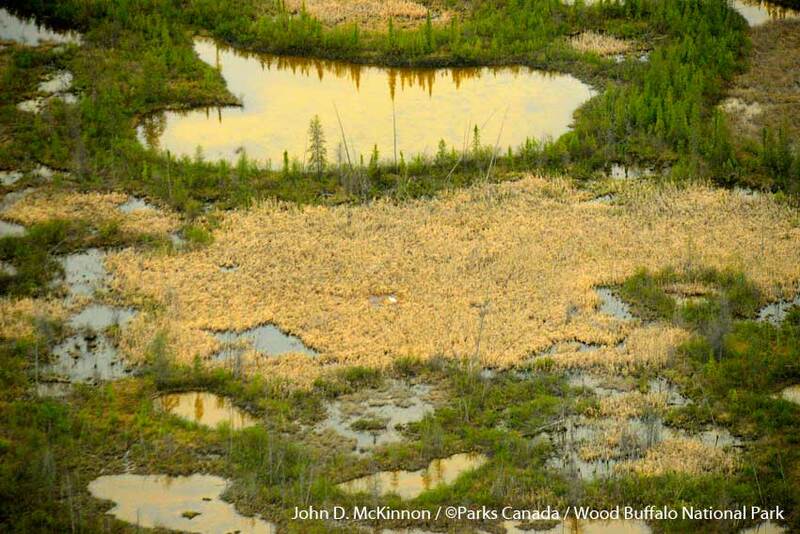 Parks Canada is a world leader in wildfire management and fire operations in the Whooping Crane nesting area are carefully managed. We are conscious that a major fire control operation in the Whooping Crane nesting area could have negative effects on the cranes or their nesting habitat and we manage fires in ways that minimize the effect on the cranes. 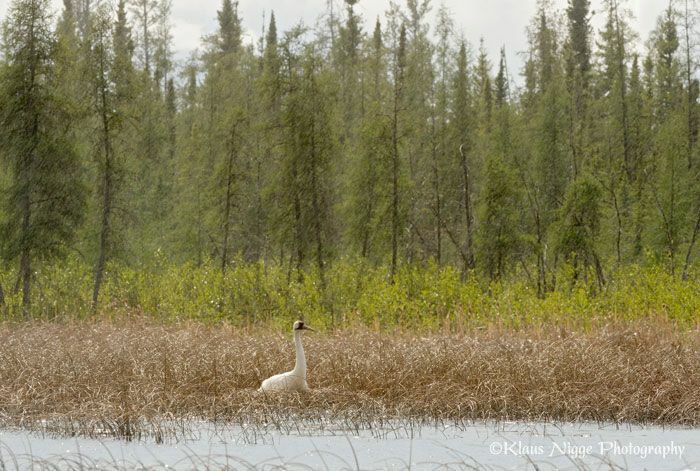 Friends of the Wild Whoopers appreciates the assistance with this interview by Tim Gauthier Partnering, Engagement and Communications Officer, Wood Buffalo National Park.